BREAKING NEWS : $500 - $5000 No Deposit Bonus Hurry up, Join Now! Trades must be entered before 5pm London time today only. Short entry following a bearish price action reversal upon the next touch of 1.0035 or 1.0046. Long entry following a bullish price action reversal upon the next touch of 0.9986, 0.9971, or 0.9957. I wrote last Thursday that higher prices were still likely to happen, but there were two key resistance levels not far away. I thought that we would see the price hit at least 1.0035 that day. I was wrong. The price has held up, although I’ve had to adjust the nearest support level down slightly. Just as the market opened in Tokyo, there was a crazy spike, which unfortunately can happen with the Swiss Franc as liquidity can be very thin and there is sometimes strange manipulation by the SNB. The resistance levels held, and it seems bulls and bears will remain evenly balanced today, so I think both the nearest support and resistance levels are going to hold and the price is most likely to range. 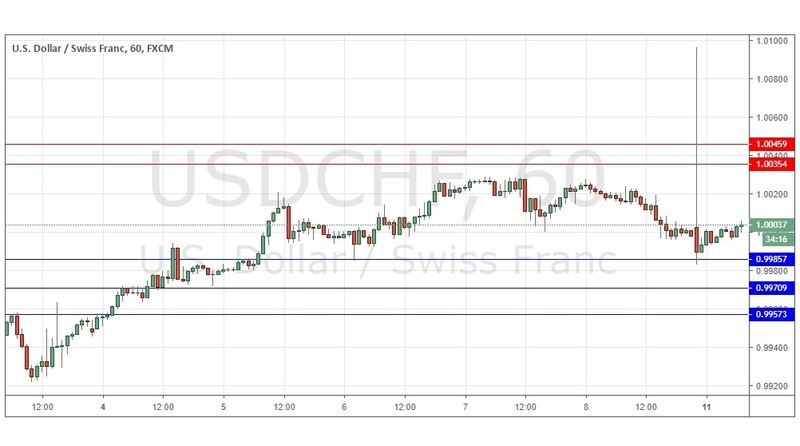 There is nothing of high importance due today regarding either the CHF or the USD. Bitmex - Bitcoin Mercantile Exchange is a cryptocurrency derivatives trading platform.